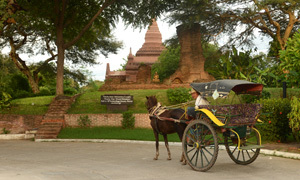 Visiting heritage sites and local villages by horse cart is one of the most authentic Bagan experiences, as the horse cart is still one of the most important modes of transportation for the Bagan people. As most horse carts have roofs, they are highly recommended for those who do not wish to get sunburned. Renting a bicycle for sightseeing when one wants to look around heritage sites at one’s own pace is a good option. Enjoy cruising on the river on your private motor boat. Witness the golden sun setting beyond the mountains and the silvery moon rising on the horizon. With cooling breezes at one’s back and perhaps a glass of wine in the hand, one can look up to the clear skies and locate constellations and even see shooting stars. 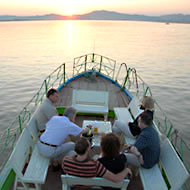 Being out on the Irrawaddy River can make one reconfirm that this world we live in is indeed wondrous and beautiful. One can enjoy playing golf amid cultural heritage sites at Bagan’s only golf course. Golf sets can also be rented at the Tour Desk.